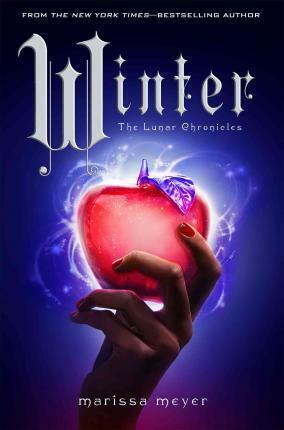 Color me surprised, I actually enjoyed this final installment of the Lunar Chronicles. I wasn't a fan of Cinder but I loved Scarlet and then I found Cress to be an absolute disappointment. So, naturally, I expected to adore aspects of Winter but I wasn't sure how well this series, one I had such a rocky relationship with, would wrap up. But every wonderful, special aspect of these series truly comes to a head in this installment and the conclusion is bittersweet but worth it. Admittedly, this is Winter's story but it feels very much like a finale, wrapping up the loose ends of all of these characters' lives. I've grown to love and admire Cinder, her growth steady yet believable. Moreover, her relationship with Kai has been so thoroughly developed over the course of these books that I really enjoyed seeing it simply be in this installment. Much like the relationship between Scarlet and Wolf, Kai and Cinder are a rock solid team. We never feel anxiety about the future of their love and it's a relief to be able to rely on their relationship in the midst of so much turmoil. Speaking of turmoil, the political nature of this series comes to a head in this installment which I adore. Levana's depravity and insanity is clear through the telling of Winter's story as she orders Jacin, Winter's guard, to kill her and then works tirelessly to destroy Winter's image and beauty among the people of Luna. I love how Meyer doesn't hesitate to expose just how terrible Levana's rule has been and as someone who adores a good backstory, the payoff was worth it in Winter. Not to mention, Levana is a worthy villain--one who isn't easy to defeat--so the revolution that Cinder wants to begin isn't always so easy as it seems. Yet, my favorite aspect of Winter was watching the two remaining love stories--Cress and Thorne and Winter and Jacin--resolve themselves. Cress and Thorne, as we know, have a great deal of leftover tension from the previous novel and their interactions are frought with all the things left unsaid between them. Jacin and Winter, though, have an entirely new dynamic--one I absolutely LOVE. Snow White is by far my least favorite fairy tale but Winter and Jacin I adore. Jacin protects her and cares for her, but he also respects her and admires her bravery. Winter, meanwhile, can trust Jacin in a way she cannot trust others in her life and Jacin, instead of simply seeing her beauty or her crazy sees her potential. Their love story is wrought with hurdles--after all, Jacin in merely a guard while Winter is a princess and, moreover, is tasked with killing her--but I enjoyed it all the more for that. Winter isn't the conclusion of one of my favorite series but it is a fantastic finale to a series that has its positives and negatives both. I am the first to admit that this isn't a perfect series and while I wouldn't endorse it the way many of its fans do, it's engaging, interesting, and original in a way few YA series are. It doesn't contain love triangles or weak heroines, it features diversity and it elaborates on messages we've all been told as children and applies it to the later stages of our lives as well. Winter was a treat and I wish I had enjoyed the rest of this series as much as I did this finale (and Scarlet) but I still look forward to what Meyer has to write in the future. A worthy ending, indeed. I haven't read this series, but I see such praise I'm almost afraid to pick it up now and be disappointed. Glad you loved the finish. So glad you thought this was a winning finale Keertana! Cress wasn't the strongest of the series for me, so I'd been hesitating to read Winter until a number of reviews were out. Definitely looking forward to seeing how everything plays out with Levana! I hope you had (are having?) a lovely trip to India! It's great that Winter turned out to be such a huge sucess for you! I started reading Cress last year but I had to put because of school - just realised now that I never picked it back up! Going to fix this asap, haha! Belated Merry Christmas and Happy New Year, Keertana! I hope you're having a great time with your family. I’m looking forward to your post about your trip and I’m very curious what books you would choose for your Top Five Books post. I haven't read this series, hopefully I’ll have time to do it this year.